Cally was home this weekend and we put up the tree. It is beginning to look a lot like Christmas around my house. Cally also decorated the outside of the house with lights. I received an early Christmas present from Cally this weekend. She has been going to lunch with Gram on Fridays since she is done with class on Thursday. This past Friday while out for lunch and shopping she bought me this gorgeous tree ornament. The message on the box said " Mothers and Daughters share a special bond that's written in the heart " I will cherish this ornament forever! So back to this pizza. It was really good. I used a quick pizza crust, even though it did use yeast it had only a 5 minute rest time. I used both provolone slices and shredded mozzarella cheese and boy was it good and cheesy! 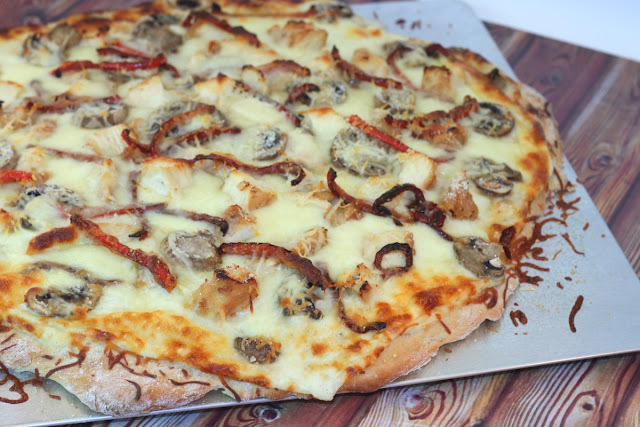 The mushrooms were a good combo with the garlicness going on and the peppers gave the pizza a little smoky taste almost. 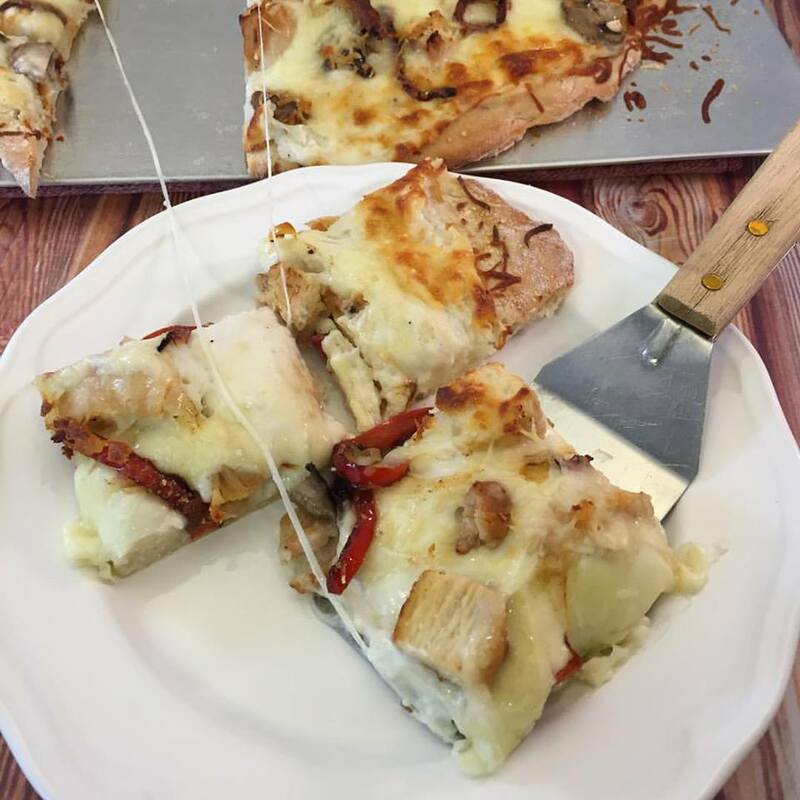 If you like garlic sauce and chicken you will have to try this pizza. melt butter in sauce pan. Add flour and stir until you have a paste like glob. Add the half and half and stir until the flour mixture is combined. Grate in the garlic cloves and continue to cook and stir until the mixture gets thicker like a sauce. Add the mozzarella cheese and stir until melted. Remove from heat. I do not like crunchy peppers so I did saute my peppers in a little butter before placing them on the pizza but this step is totally optional. After the sauce is done, spread the sauce on your pizza crust. Lay the provolone cheese slices on, then the shredded mozzarella. Then layer all the remaining toppings. Bake 20 to 25 minutes or until pizza is done. What a fantastic looking pizza!! I'd love for you to come share it at Simple Supper Tuesday this week. Hope to see you there! What an awesome looking pizza!! I'd love for you to come share it at Simple Supper Tuesday this week. Would like to see you there! What a fantastic looking how to make money online pizza!! I'd love for you to come share it at Simple Supper Tuesday this week. Hope to see you there!